Just wondering, I have a mess of TMC 2302 #12 hooks. Are they considered strong enough. What do most chironomids fishers recommend? 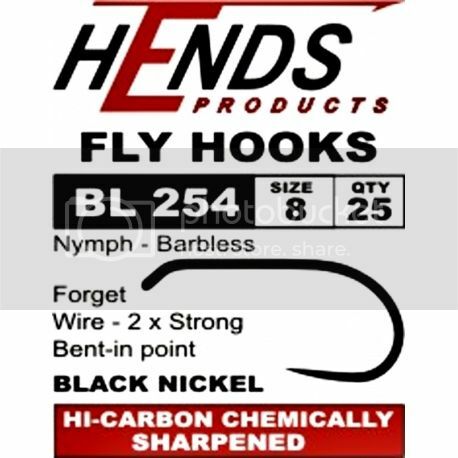 Just look at other nymph hooks you have and if the shank appears to be the same thickness they should be good. Also if you have some Umpqua 135 or 202 bent shank hooks and they look the same then they will be more than strong enough. Hope this helps. I like using Tiemco #2457 hooks, in size 12 - 18. I also like Tiemco #200R hooks for bombers. I have never liked the 2302 due to its tiny hook gape, which I found had just terrible holding ability. I liked the curved grub hooks, like the 2457. But I think the 2302 is still a favorite for many chironomiders. I still like the old stand by MustadC49s hooks. This winter I have been tying on Tiemco TMC2499Sp-BL and Daiichi 1250s. They look better. I am anxious to see if they work better. I guess I will find out in May. Sure, they're fine for smaller fish. I use the Daiichi 1760. Same profile as the 2302 but 2x heavy. I've never had a problem with holding ability. I use 1x and 2x as my anchor patterns and standard wire on most other buzzer patterns. I dont use beads so the 1x and 2x on smaller tippets works very well. These are tied TLC style. As you can see I also use more of a hot spotting technique for varying light conditions through out the day. I find this more critical than trying to get the buzzer colour correct. Profile is critical as is the translucent effect when tying buzzers in conjunction with the hot spots. Sandy Dickson is a very well know buzzer angler and fly designer from Scotland and it is his philosophies on buzzers that a lean heavily towards in fly design for this style of pattern. 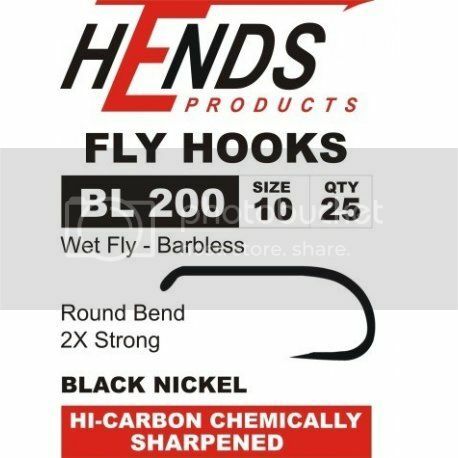 The hooks I use are the "Hends" Barbless series. 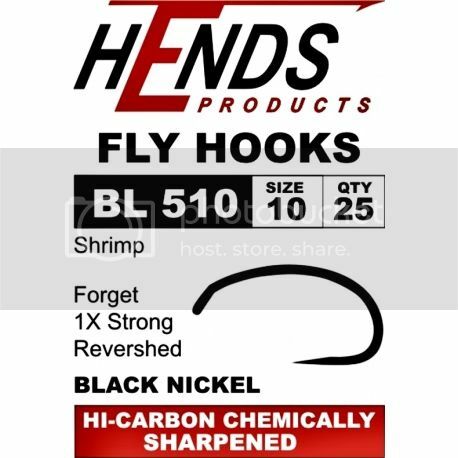 They are a high quality hook made in Japan at a hook mill that is one of the best around and are sold through czech Republic under the Hends corporation. 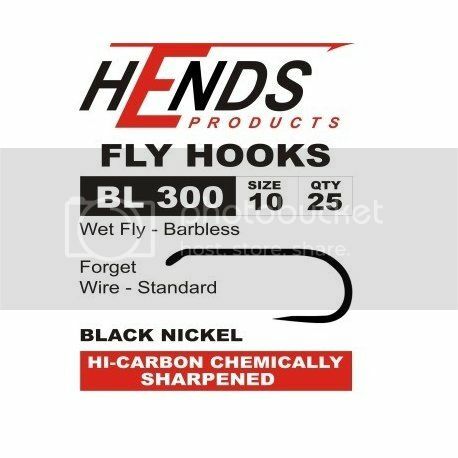 I often tie on this hook as well for very slim narrow profiles and utilize the hook 2X strong as additional weight and hook strength. Straight shanked hooks make excellent quilled style buzzers. This series I often use on a washing line because the fly pattern usually only fishes down a couple feet and weight from the heavier shank is not needed with this technique for this shallow of a drop. 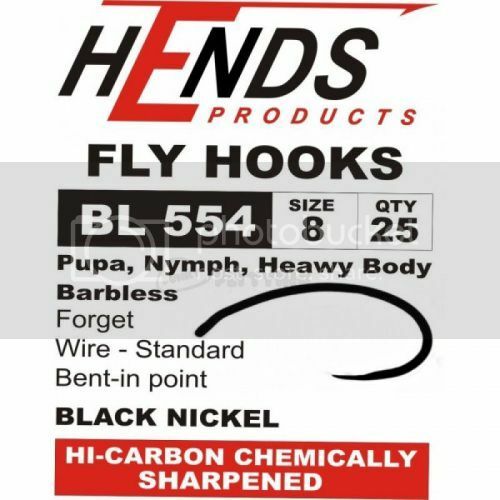 This is a very stout hook and the curved body works very well on buzzers and other imitations to resemble different stages of the buzzer during its accent. Here a simple quilled or threaded buzzer can be used or any of the Cruncher style or Snatcher style patterns work well on these heavier hooks. On this hook the standard buzzer imitations have a great profile and the standard wire with again the black nickel finnish works very well as a general searching pattern. The bottom pattern is using the new Magic Quill material that we are now carrying through Eastslope Distributors Ltd.